The first exciting development we’d like to share with you is that Matt and I are the new – and only – travel app reviewers for appSmitten.com! This site hand-selects the best apps in several categories (food, kids, health, news, education, etc. ), then sends you weekly or daily recommendations via email to help keep you organized, entertained, productive, etc. Kelley’s Break Room is a really funny humor blog I’ve been following for a while. I was tickled – and a bit like “who, me?” – that she considered me humorous enough to write a guest post last week! In my oh-so-compelling post, 5 Ways to Create a Family Vacation You Can Actually Afford, I offer some ideas to incorporate fun into cheap (sorry, “budget-friendly”) family travel. While bringing the funny. I hope I succeeded; what do you think? The Azumano Travel Show, a radio program on AM860 radio in Portland, OR, interviewed me last week about our strange compulsion to visit BIG roadside attractions! The best question they asked me: “If you could build a world’s largest, what would it be?” Hint: My answer involved food. Naturally. A week ago today, we road-tripped to Pittsburgh, PA for the long President’s Day weekend. We have much to share over the coming weeks about the BIG things there. Our first meal was at the original location of Primanti Bros., a culinary institution which was recommended by pretty much everyone. 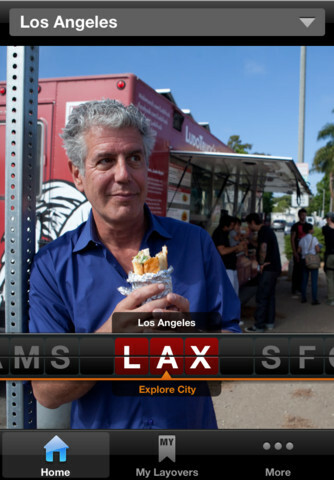 It’s known for BIG sandwiches with a wide selection of fillings. The fluffy bread was the only "light" part of this 'wich! 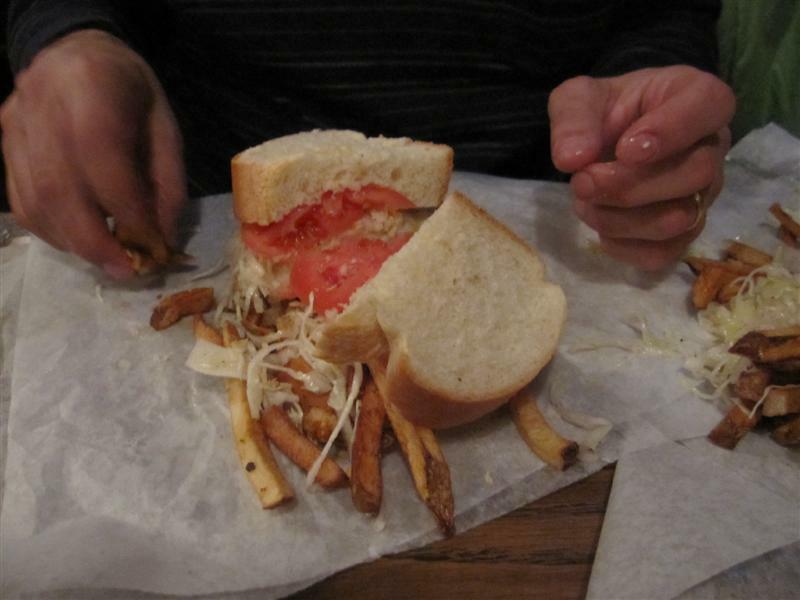 When you order sandwiches with “the works,” you will get tomato, cole slaw, and – oh yes – French fries. ON the sandwich. At this point, the Go BIG family has seen some pretty quirky, offbeat, and strange things. Like a 27-ft wide pancake griddle. Animatronic milk cartons. Underground poutine. A giant bacon cheeseburger sandwiched inside a glazed doughnut. And don’t even get me started about South of the Border. I still haven’t found the words to write about our evening there. Still, as someone with OCD in her gene pool — and two packs of antibacterial wipes in her purse at all times — it was difficult for me to process the idea of Bubblegum Alley. 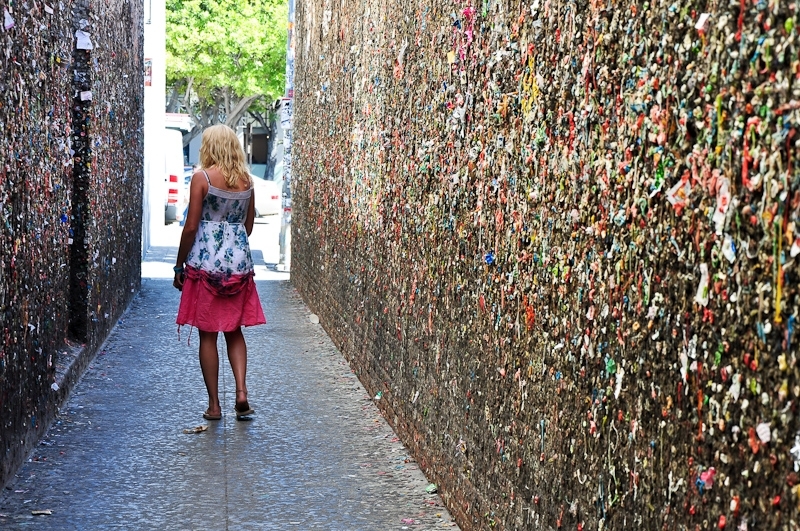 This month’s guest post features the world’s largest collection of “ABC” (already been chewed) gum, which is stuck to the walls of Bubblegum Alley , a 70-foot long, 15-foot high landmark in San Luis Obispo, CA. That's not paint, folks. It's gum. That's been chewed. I’ve never met a state or county fair I didn’t like. 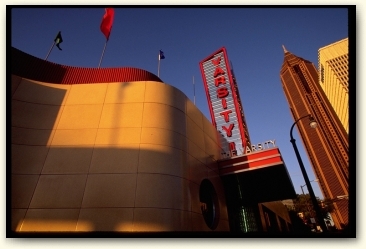 They retain the flavor of old-fashioned American fun, even though they’re no longer an inexpensive day out! 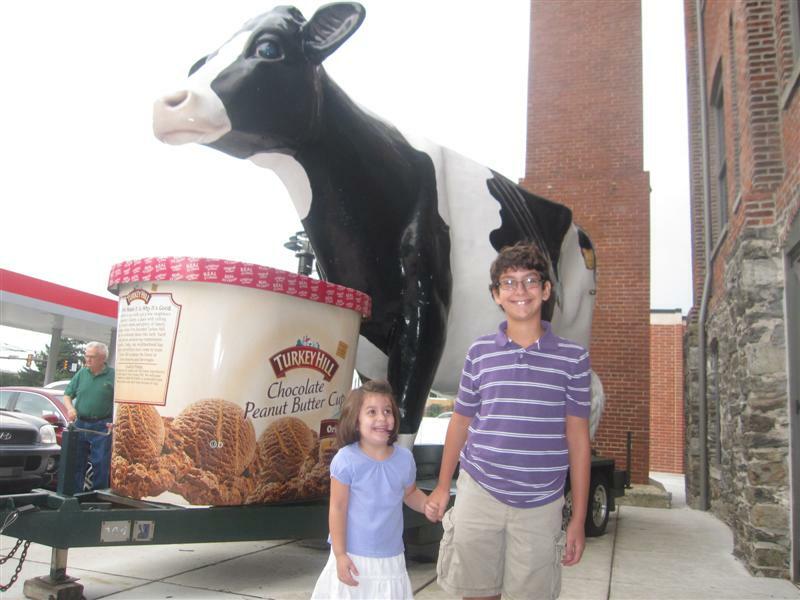 Last year, we went to the Big E in West Springfield, MA. 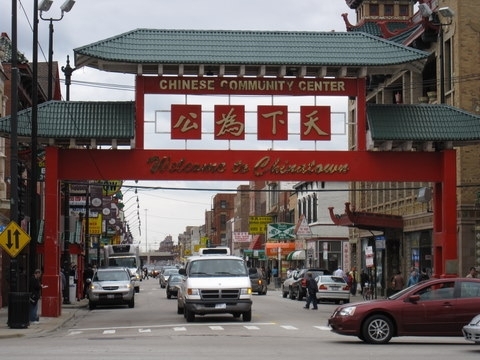 It’s the state fair of Massachusetts and several other New England states, and it’s where you’ll find the world’s largest traveling amusement park, the North American Midway. The highlight of the day was sampling the Craz-E burger, a bacon cheeseburger sandwiched between two halves of a glazed doughnut. Yes, you read that right. I’m not up for an Oscar nomination, but the video clip we posted of The Boy’s first Craz-E bite captured a really fun Go BIG moment! This year, the Big E takes place September 16-October 2. 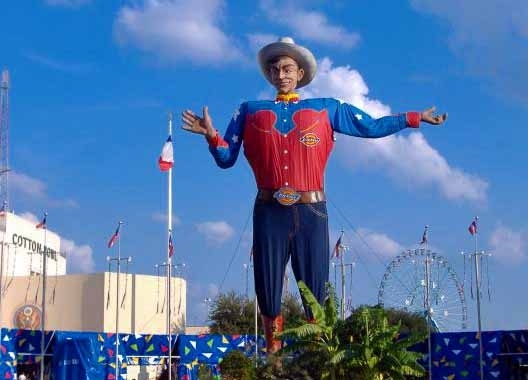 The world’s largest state fair, not surprisingly, is the State Fair of Texas. Three million people are expected to attend this 125-year old institution, which begins in Dallas next week (September 30) through October 23. Our friend Jessica at Suitcases and Sippycups goes almost every year, and has provided us with our PHOTO FRIDAY today! 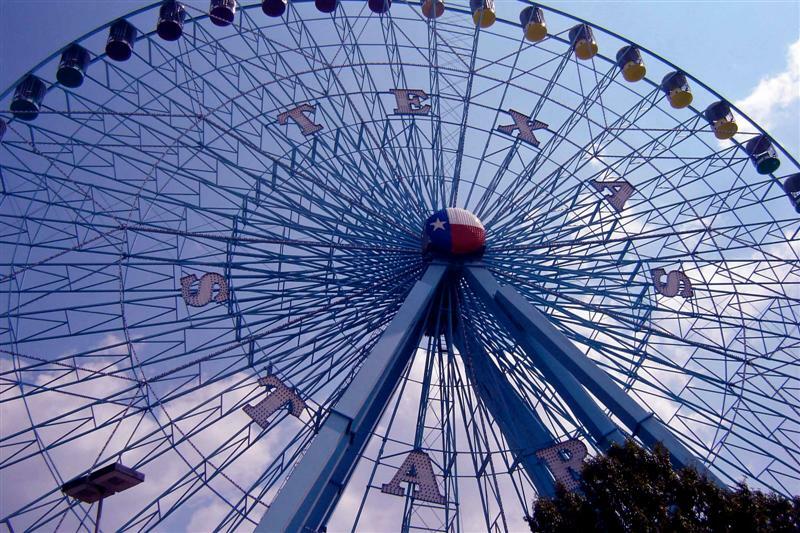 This is the 212-foot Texas Star ferris wheel, the tallest ferris wheel in North America! It can carry up to 264 passengers in its 44 gondolas. This is Big Tex (can’t help but love that name! 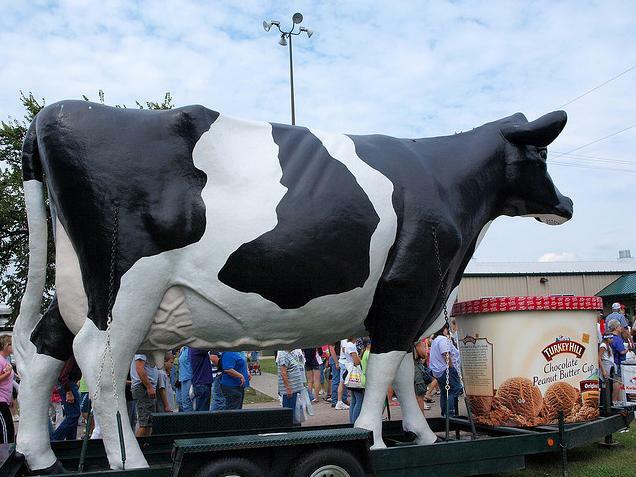 ), the 52-foot tall icon of the state fair! Jessica shares, “His voice booms all over the state fair. Most of the time he just makes general announcements about upcoming shows or events. But every now and then he makes a personal comment about someone’s shirt or hair in the crowd. 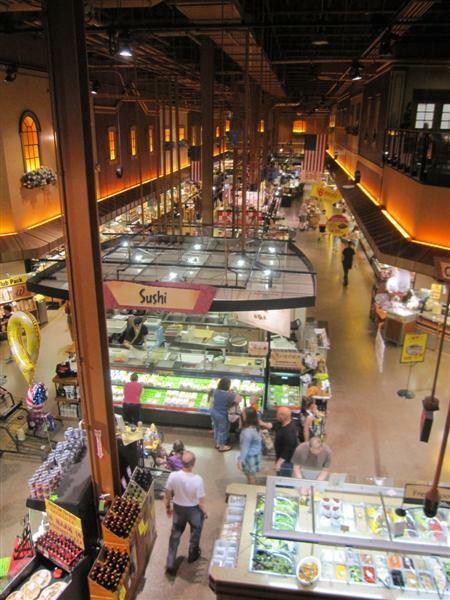 It is hilarious to watch people look up at him and marvel at how the giant statue can see them.” Thanks, Jessica! Who’s headed to a BIG fair soon? 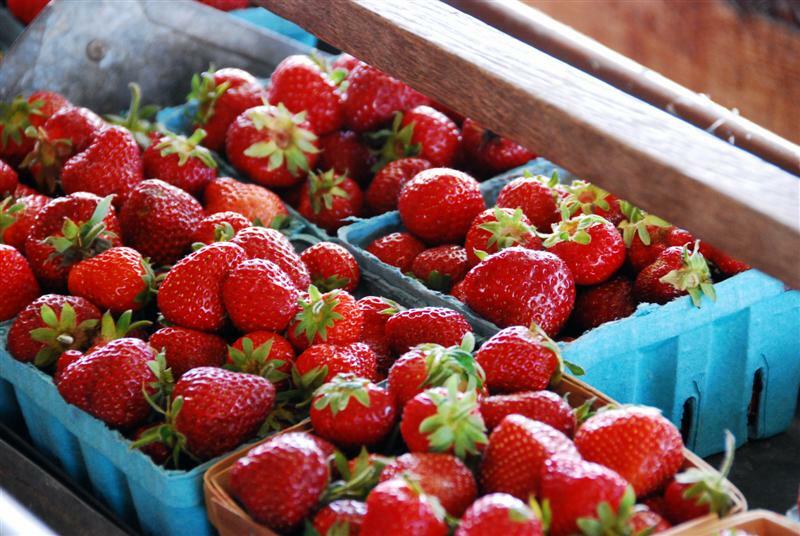 What’s your favorite fair food? We’re partial to deep-fried Oreos. 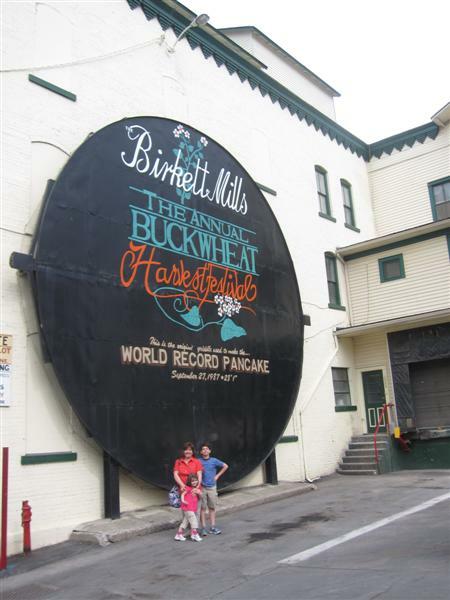 On our way up to Rochester last weekend, we stopped to see the World’s Largest Pancake Griddle in Penn Yan, NY! Don’t we look tiny in front of this thing? It measures 27 feet across. It is not lost on me that The Boy has grown nearly as tall as me…sigh…he needs to stop doing that. So, the story is that on September 27th, 1987, the Birkett Mills company cooked the world’s largest (buckwheat) pancake in this huge griddle, which was placed over hot stones. They mixed the batter in a cement mixer, and flipped it with a crane. After we left, I tweeted that I think Penn Yan is Dutch for “middle of nowhere.” The very nice staff at the Penn Yan Public Library responded, graciously setting me straight as to the true origins of the name. 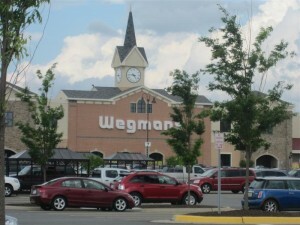 In its early days of settlement, the town welcomed emigrants from Pennsylvania as well as from the New England states. “Penn Yan” credits both parties – “Penn” in honor of Pennsylvania, and “Yan” in honor of the Yankees, as all people from the New England states were called. I’m sharing this on Photo Friday at Delicious Baby. Who’s Got the Best Caption? We are surrounded by clever, funny people who read this blog…you know who you are. Today we want your captions for some of these photos from our “Go BIG” travels! Many of these photos never even made it onto this site due to space constraints, but most are on our Facebook page. 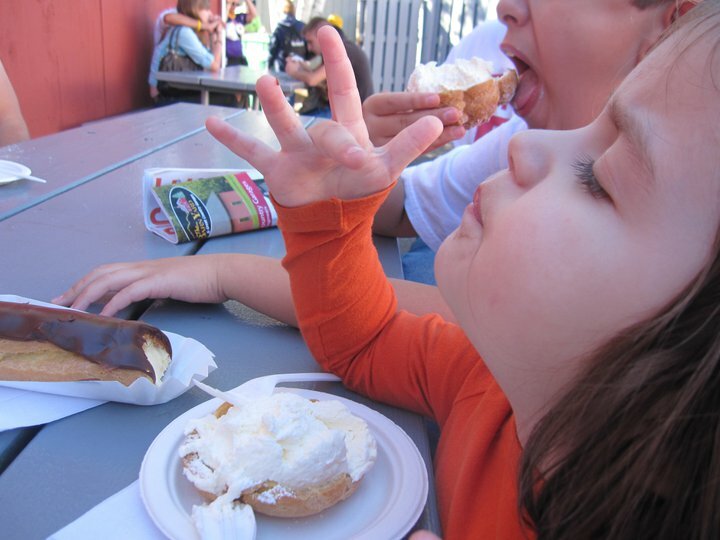 When we went to the The Big E fair (world’s largest traveling amusement park), we felt compelled to partake in the specialty dessert, the Big E Cream Puff, and its cousin, the E-Clair. The resulting sugar crash was NO fun. You’ve all seen the typical Italy vacation photo of the tourist trying to hold up the Leaning Tower of Pisa through tricky photography. 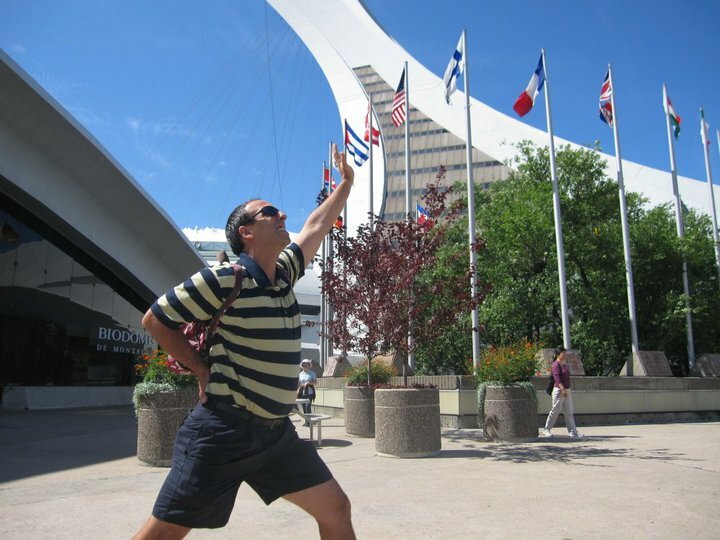 Matt was up for trying something similar at the world’s tallest inclined tower in Montréal. 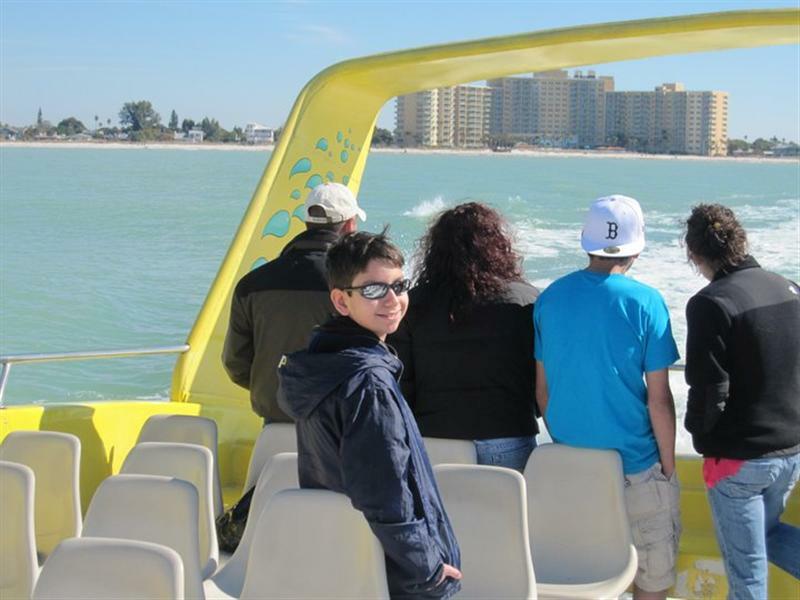 It was Day One of our holiday road trip to FL, and we were hoofing it to get ahead of a huge snowstorm in NY. 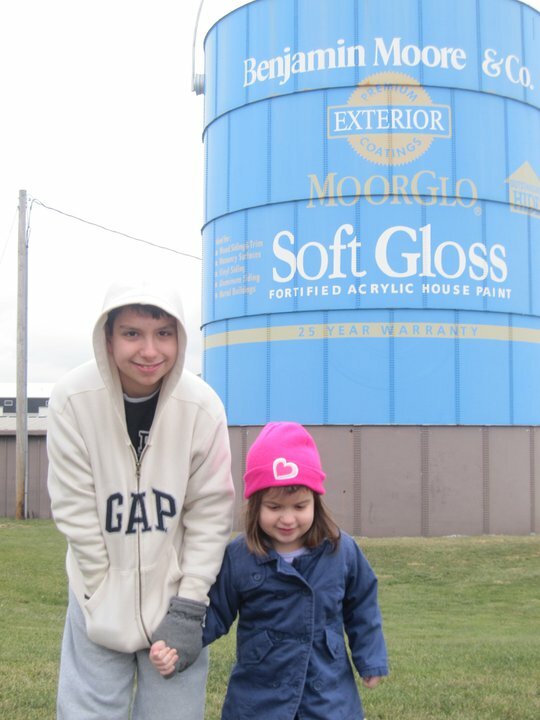 Of course, there’s always time to stand the kids in front of a huge paint can! Even if it was 20 degrees out. I would be reminded of this day several weeks later, back home. We were driving past a regular, cylinder-shaped water tower. The Girl (3 years old) innocently asked if we were going to get out and take its picture. Sometimes I wonder what she’ll tell her kids about me.